"The nature of this party is not to oppose but to love China; not to oppose the Communist Party but to urge the Party to reform and transform; not to endanger national security but to promote a democratic system with patriotism..."
Overview: Essayist Sentenced to 12 Years for "Subversion of State Power"
Huang Jinqiu is a talented and prodigious writer with a style that is alternately biting and tender. A graduate of the prestigious Lu Xun Literature Institute in Beijing, Huang began working as a reporter at age 18 at a magazine in his native Shandong province, and published his first book of essays at age 20. In the second half of the 1990s, Huang continued his work as a reporter and then as editor for several magazines and newspapers. In 2000–2003, Huang studied abroad, first in the broadcast department at the Central Academy of Art in Malaysia on full scholarship (and became a lecturer in that department upon graduation), and then at the University of Lincoln in Lincoln, UK, where he received a bachelor's degree. 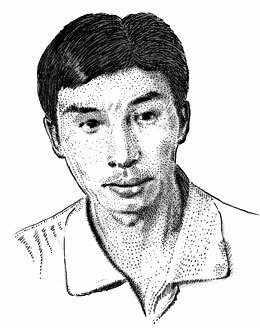 In 2000, while studying overseas, Huang began writing a series of essays under the pen name of Mr. Clear Water that were sharply critical of the Chinese Communist Party, which he published on Boxun.com, a US-based dissident news website. abolish measures that restricted citizens' movement. Two days later, the Communist Party published an editorial in the People's Daily on August 8, 2000, titled, "Intensify the Struggle on the Internet Battlefront" (Jiaqiang Wangluo Zhanxian Douzheng "加强网络战线斗争"). Though the editorial did not refer to Huang by name and it is unclear whether the authorities were directly responding to Huang's August 6 article, it did declare the "representatives" of "the overseas anti-China forces and organizations" as the enemies. Instead of backing down, Huang went much further in his second essay, "Are the Chinese an Inferior People?" (Zhonghua Minzu shi Liedeng Minzu ma? "中华民族是劣等民族吗?," September 1, 2000). In the essay, Huang excoriated the Chinese Communist Party for having led China on a downward path, turning the Chinese people from being the inventors of gunpowder, paper, and the compass into a crude people who spoke in expletives and spat all over the street. He attributed the disunity among the Chinese people to the CPC's philosophy of struggle and to the legacy of coarseness the Cultural Revolution left behind. He wrote that it was China's great "misfortune" to have run into the Communist Party dictatorship. "Without the specter of the Chinese Communist Party dictatorship, how great would the Chinese people's accomplishments have been?" he asked. In "My World View," (Wo de Shijieguan "我的世界观," December 2001), a parable of world history, China is depicted as a warrior escaping a forest fire (China surviving military defeats by Western powers and Japan). The warrior found a wild horse (the Communist Party) which he loved and tried with great efforts to tame. But, in the end, the horse threw him into a mud pit on a precipice instead. The warrior eventually found a river where he could drink from, and then set out to look for the ocean of civilization. The warrior finally found the ocean of civilization and saw his beloved waiting for him across the waters holding up a torch. From 2000 to 2003, Huang published more than 300 articles on Boxun.com, which made him famous in the Internet community but also further invited the wrath of the Chinese leadership. The nature of this party is not to oppose but to love China; not to oppose the Communist Party but to urge the Party to reform and transform; not to endanger national security but to promote a democratic system with patriotism; not to oppose the 70 million Communist Party members but to oppose the dictatorial system of the dictatorial Communist clique and any persecution; not to oppose specific Communist leaders but to oppose the Communist dictatorial machine that came into office without the foundation of popular will, the supervision of public opinion, and democratic elections. In June 2003, Huang returned to China after finishing his overseas studies, having turned down many offers from friends to help him settle in Denmark, the United States, and Australia. He also planned to register the China Patriot Democracy Party on September 19 in Beijing. Beginning on August 15, Huang became aware that he was being followed by state security police. Less than a month later, on September 13, he was detained by the Changzhou public security police in Changzhou, Jiangsu Province. He was formally arrested on January 9, 2004, four months into his detention, on "suspicion of subversion of state power." Huang had anticipated his arrest and the crime with which he would be charged, and presented his own defense, before his detention, in an open letter to the "judge and prosecutor," titled, "Subversion: Not Guilty; Democracy: Justified." He declared that he would be willing to be tried on the charge of "subversion of the Chinese Communist Party dictatorship" but never plead guilty to the charge of "subversion of state power" [emphasis added]. Rather, he named the Chinese Communist Party itself as the arch-criminal, who broke up China and created "turmoil" by violently overthrowing Sun Yatsen's Republic of China, and took the opportunity of the Japanese occupation to usurp political power. ...a warlord regime propped up by the barrels of guns, a terrorist regime which employs bayonets and shackles as tools of governance, a destructive mafia-like regime with a prior criminal record of repeated evil deeds resulting in countless calamities to the nation and its people. The trial of Huang Jinqiu began on June 22, 2004. in the Changzhou Intermediate People's Court in Jiangsu Province. The court adjourned several times without a decision, apparently because of insufficient evidence. The trial finally concluded on September 27 with a guilty verdict. Huang was sentenced to 12 years in prison and four years of deprivation of political rights. Huang appealed the verdict. On December 9, after a second trial, the Jiangsu Provincial High People's Court affirmed the lower court's decision. Huang was transferred to the Pukou Prison, Nanjing, Jiangsu province, to serve his sentence. In March 2005, the Shanghai Department of Justice suspended the license of Huang's Shanghai-based defense attorney, Guo Guoting, who also represented other "politically sensitive" cases, including those of Falun Gong practitioners. Guo emigrated to Canada later that year. In 2007, upon appeal, Huang received a sentence reduction of one year and 10 months. He is expected to be released in December 2013.
had not received any letters from home. The prison sent Huang to a mental hospital right after his second trial in December 2004. The hospital, after examining him, determined that he was not mentally ill and refused to admit him. Everyday, Huang was forced to run 180 200-meter laps, a total of 36 kilometers. He was beaten when he could not run anymore because his feet had broke open. He was beaten up by fellow inmates. The authorities denied several requests from Huang to be transferred to a prison closer to his parents in Shandong, now in their 60s, who had to spend seven to eight hours on the road for each visit. The following information was provided by Huang's sister and father in late September and early October 2008. Huang's family last visited him in October 2007. (Huang told his family not to visit him because he did not want them to spend money.) His health was okay then and his mood was fine. Huang is allowed one phone call to his family each month. He last called home on Mid-Autumn Festival (September 14, 2008) and said everything was fine with him and that he was working on his second appeal to have his sentence reduced. Huang is allowed to read books and newspapers. Previously his family could send him books, some of which he never received. But now he is only allowed to receive letters from family members and other people, but all letters are screened. His family does not know whether he is allowed to exercise or work. He suffers from arthritis. The U.S. Department of State and members of the U.S. Congress have called for Huang's immediate release from prison. The U.S. Department of State highlighted Huang Jinqiu's case in its Country Reports on Human Rights Practices in 2005, 2006, and 2007. On June 28, 2008, US Congressmen Christopher Smith and Frank Wolf met with with Li Zhaoxing, former Foreign Minister and Ambassador to the U.S., and current Chairman of the Foreign Affairs Committee of the National People's Congress, and presented a list of 734 political and religious prisoners that included Huang Jinqiu to demand their immediate release. "Changzhou Intermediate People's Court Accepts Subversion of State Power Case" (常州市中级人民法院受理一起颠覆国家政权案), June 22, 2004, Changzhou Intermediate People's Court Website (常州市中级人民法院网站), http://www.jsczfy.gov.cn/plus/view.php?aid=13870. "Huang Jinqiu's (Mr. Clear Water's) 'Subversion of State Power' Defense Statement," (黄金秋(清水君)“颠覆国家政权罪”辩护词), posted by "Bleating Sheep" on Chineselawyer.com, http://www.acla.org.cn/forum/printthread.php?Board=34&main=544033&type=post. Huang Jinqiu's Subversion of State Power Case (黄金秋颠覆国家政权案), posted on Chinalawinfo.com (北大法律信息网), http://vip.chinalawinfo.com/Case/DisplayContent.asp?Gid=117490381&keyword. Ruling of Huang Jinqiu's Subversion of State Power Case, 2nd trial (黄金秋颠覆国家政权案 裁定书), Jiangsu Provincial High People's Court (江苏省高级人民法院), December 9, 2004, http://vip.chinalawinfo.com/Case/DisplayContent.asp?Gid=117485112&keyword=. Guo Guoting (郭国汀),"Why Did I Defend Mr. Clear Water?" (我为什么为清水君辩护? ), May 25, 2004, http://crd-net.org/Article_Show.asp?ArticleID=567. Guo Guoting (郭国汀), Outline of Appeal for Huang Jinqiu's Subversion of State Power Case (黄金秋颠覆国家政权罪上诉案辩护词纲要), December 9, 2004, http://www.boxun.com/hero/guoguoting/60_1.shtml. Below is a listing of HRIC's advocacy and media work on Huang Jinqiu, including press release, statements, and case updates. To subscribe to HRIC's press list, please e-mail communications@hrichina.org with "SUBSCRIBE" as the subject heading. Media Censorship: Internet Activists / Journalists / Websites, Monthly Brief, September 30, 2004, http://www.hrichina.org/public/contents/18995. In Custody: People Imprisoned in Connection with Journalism or the Internet, China Rights Forum, 2005, No. 1 (April 21, 2005), http://www.hrichina.org/public/PDFs/CRF.1.2005/1.2005InCustody.pdf. Appeal for Imprisoned Activists, China Rights Forum, 2005, No. 1 (April 21, 2005), http://www.hrichina.org/public/PDFs/CRF.1.2005/1.2005ActionPage.pdf. "A profile of Mr. Clear Water" ("清水君其人其事"), August 24, 2004, Boxun.com, http://www.boxun.com/hero/qingshuijun/166_1.shtml. Based in the United States, Boxun.com is a popular Chinese community website. It consists of four sections: news in Chinese (Peacehall.com), blog in Chinese (Boxun.com/blog), news in English (Boxun.us), and video (Boxun.tv). All four sections allow free posting of material without editorial control. The website attracts many China-based activists who post articles and information about their activities (including legal documents of court cases). The website describes its blog as "one of the earliest Chinese blogs, and counts among its bloggers almost all of the famous Chinese writers living abroad." Boxun has a mechanism that automatically links any posted story to a group of related stories and articles already posted on its website. Most of Huang Jinqiu's more than 300 articles are available on Boxun. The website is blocked in China. Jiang Zemin, CPC General Secretary, 1989–2002. Qing Shuijun [清水君] (Huang Jinqiu [黄金秋]), "Zhonghua Minzu shi Liedeng Minzu ma?" [中华民族是劣等民族吗], Boxun [博讯], September 1, 2000, http://www.boxun.com/hero/qingshuijun/149_1.shtml. Qing Shuijun [清水君] (Huang Jinqiu [黄金秋]), "Wo de shijieguan" [我的世界观], Boxun [博讯], December 2001, http://www.boxun.com/hero/qingshuijun/143_1.shtml. "本党的性质，不是反中，是爱中；不是反共，是促共改革和转变；不是危害国家安全，是热爱国家推进国家民主制度；不是反对中共7000万党员，是反对中共独 裁集团的独裁制度和任何迫害，不是反对具体的中共领导人，是反对没有民意基础没有舆论监督更没有民主竞选的中共独裁机器。" Qing Shuijun [清水君] (Huang Jinqiu [黄金秋]), "Zhonghua aiguo minzhu dang chouweihui zhi aiguo minzhu tongren de jianyi" [中华爱国民主党筹委会致爱国民主同仁的建议], Boxun [博讯], January 9, 2003, http://www.boxun.com/hero/qingshuijun/3_1.shtml. Huang Jinqiu [黄金秋], "Gaosu ni yige zhishi de Qing Shuijun" [告诉你一个真实的清水君], March 3, 2006, Chinese Human Rights Defenders [维权网], http://crd-net.org/Article/Class18/Class26/200603/20060316234421_541.html. Guo Guoting [郭国汀], "Huang Jinqiu an xingshi shangsu zhuang" ([黄金秋案刑事上诉状], October 7, 2004, Chinese Human Rights Defenders [维权网], http://crd-net.org/Article/Class18/Class26/200410/20041007231347_535.html. "Qing Shuijun qirenqishi" [清水君其人其事], Boxun, August 24, 2004, http://www.boxun.com/hero/qingshuijun/166_1.shtml. "Huang Jinqiu" [黄金秋] Information on Imprisoned Writer," Writers in Prison Committee of the Independent Chinese PEN Center [独立中文笔会狱中作家委员会], http://www.penchinese.com/wipc/01wipl0/02hjq.htm. Qing Shuijun [清水君] (Huang Jinqiu [黄金秋]), "Dianfu wuzui, minzhu youli" [颠覆无罪、民主有理], Boxun [博讯], http://www.boxun.com/hero/qingshuijun/150_1.shtml. "如定清水君“颠覆中共独裁政权”罪，清水君可以接受判决；如以“颠覆国家政权”来判罪，清水君永远不会认罪！" From Qing Shuijun [清水君] (Huang Jinqiu [黄金秋]), "Dianfu wuzui, minzhu youli" [颠覆无罪、民主有理], Boxun [博讯], http://www.boxun.com/hero/qingshuijun/150_1.shtml. "…也就是一个以枪杆子为支柱的军阀政权，是一个用刺刀和镣铐作为统治工具的恐怖政权、 是一个罪恶累累有无数祸国殃民罪行前科的带有黑社会犯罪组织性质的破坏性政权！" From Qing Shuijun [清水君] (Huang Jinqiu [黄金秋]), "Dianfu wuzui, minzhu youli" [颠覆无罪、民主有理], Boxun [博讯], http://www.boxun.com/hero/qingshuijun/150_1.shtml. Guo Guoting [郭国汀], "Bianhu lÜshi diwuci huijian Qing Shuijun" [辩护律师第五次会见清水君], 中法网 法制文学社区, November 13, 2004, http://www.1488.com/china/legalcomm/filecenter/showfile.asp?pkid=4904. "Duli zuojia Huang Jinqiu (Qing Shuijun) zai yu zhong shoudao yanzhong nüedai" [独立作家黄金秋（清水君）在狱中受到严重虐待], Radio Free Asia [自由亚洲电台], February 21, 2005, http://www.rfa.org/cantonese/news/china_dissident-20050221.html. Zhang Liming [张丽明], "Jiaren xiwang Huang Jinqiu nenggou huo jianxing" [家人希望黄金秋能够获减刑], Radio Free Asia [自由亚洲电台], September 15, 2006, http://www.rfa.org/cantonese/news/china_dissident-20060915.html.